When we add some fun, hands-on play using interesting materials the whole atmosphere of our math learning changes. We have smiles, and giggles, and people jumping to volunteer to answer the next question. 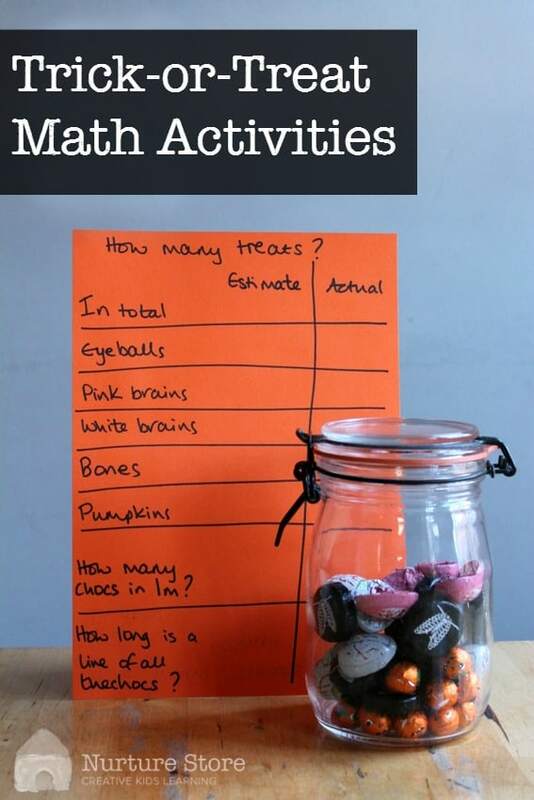 Our pine cone math station was a big hit last month, so today we used some Halloween treats to set up another math activity. 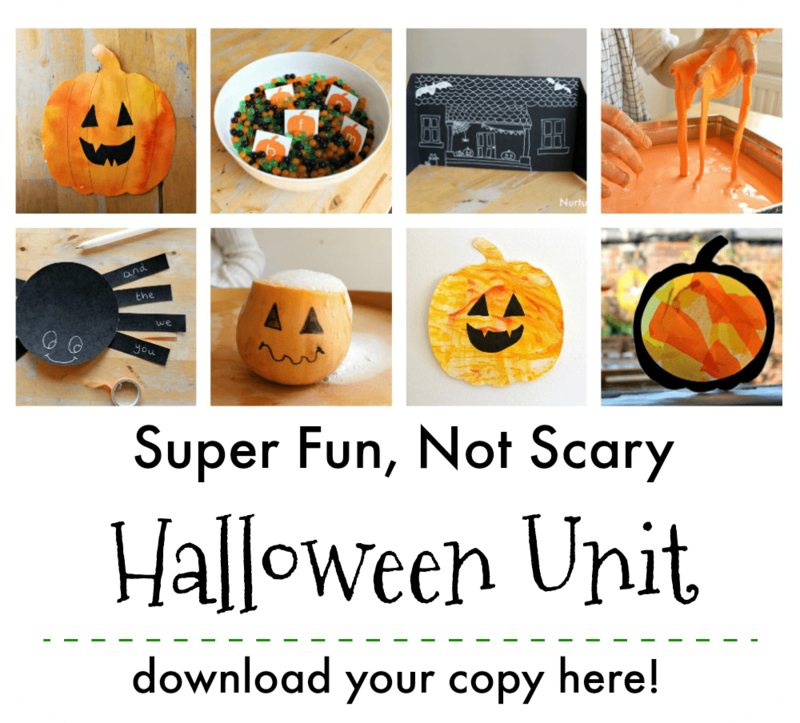 I started by gathering a collection of trick-or-treat goodies in a glass jar, and drawing up a series of question prompts. 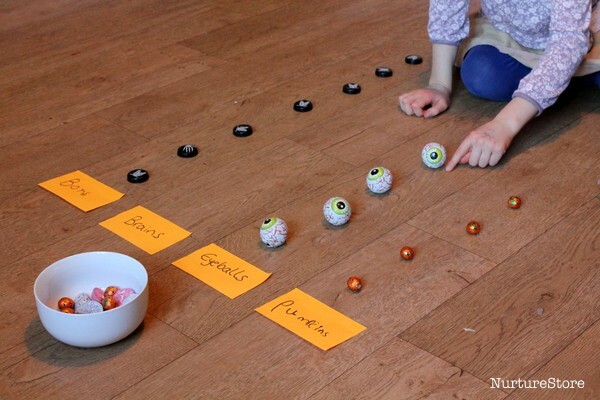 I set them out as a table, so my daughter could practise reading and recording data. I included a column for estimates, along with one to record accurate answers. Estimation is an important skill, helping you ‘sense check’ that your calculated answer is about right. 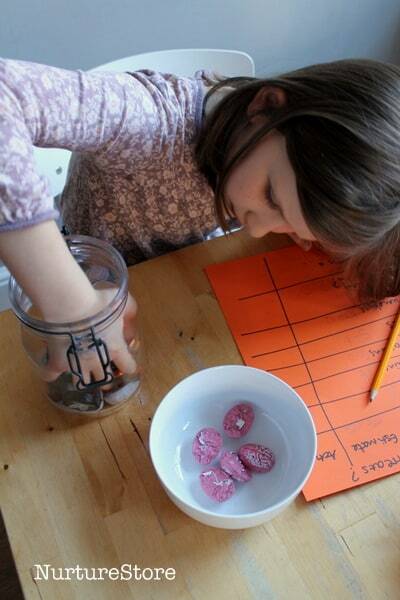 It’s also good for children who have a fear of having a go at answering a question, worried they’ll get it wrong. If we encourage everyone to say what the answer might be, they can start to work on their answer without the pressure of thinking they must get it right. We started by working out how many of each type of treat there was in the jar. 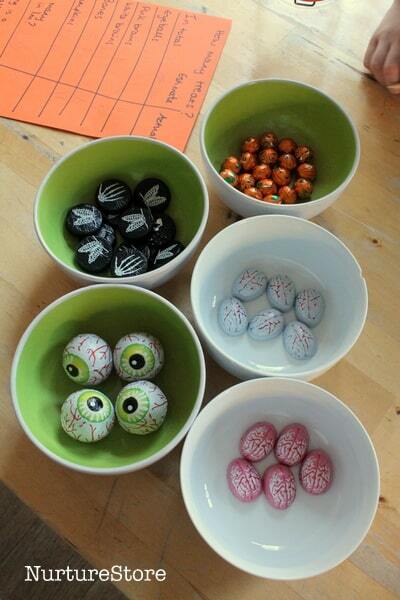 Then we sorted our brains, eyeballs, bones and pumpkins into bowls to count the correct answer. 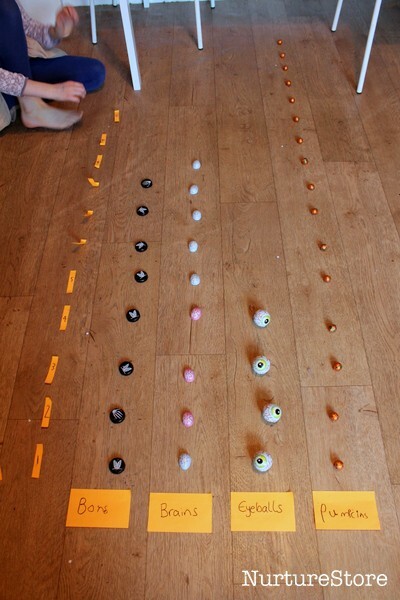 We guessed how many treats we’d need to make a 1 metre long line, and how long a line we could make if we used all our goodies. Then we used a tape measure to work out the actual answer. We also used our math station to work on some different graphing techniques. 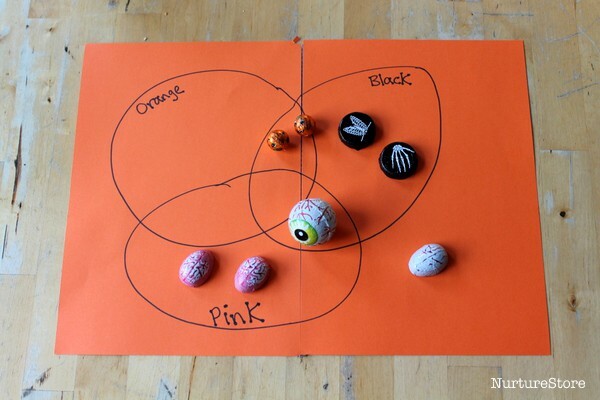 We introduced the concept of Venn diagrams and decided to sort our chocolates by colour. 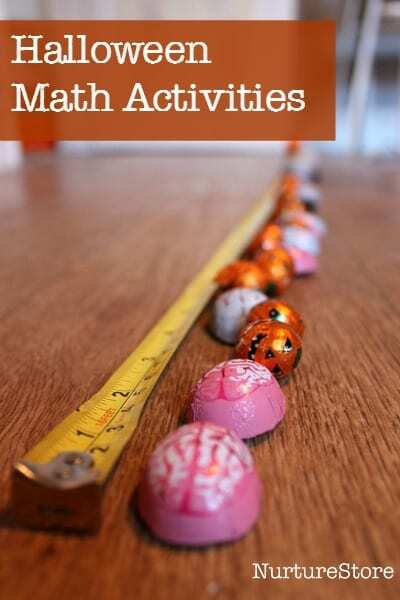 There is so much value in using real items and doing hands-on activities to work on math concepts, rather than only working on paper and with abstract ideas. Plus, you might get to eat any treats that don’t fit within the diagram! Then we made a bar chart, using our chocolates to create the bars. The children loved the scale of this graph, as it stretched across the floor and under the table. We talked about how graphs are useful for conveying detailed information is a clear, visual way. It was so obvious we had more pumpkin chocolates than any other types when they were displayed in this way – so much easier to see than when they were in the jar. We use post-it notes to add the details to the axes on our graph: the type of chocolate along the x axis and numbers up the y axis. I had the children stand along the bottom axis and see if they could tell exactly how many pumpkins we had just by looking. Too many to say without counting! But when I said they didn’t need to count but could just find the matching number on the y axis my younger daughter said ‘Ohhh, that’s a cool way to do it!’ I love it when we see a light-bulb go on in a child’s brain and know they have grasped a new concept.